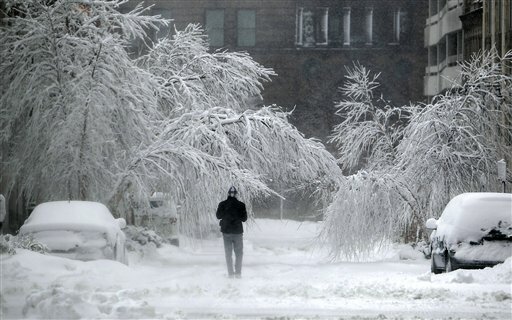 More than 100,000 homes and businesses lose electricity, and at least three deaths are blamed on the blizzard. The Missouri Department of Transportation issued a rare “no travel” advisory, urging people to stay off highways except in case of a dire emergency. Conditions were so bad that some snowplows slid into ditches, underlining the danger even to well-equipped travelers. “It’s straight hell. It’s snowing, blowing, drifting, everything,” said Robert Branscecum, a trucker from Campton, Ill., who was hauling Wal-Mart merchandise to Dallas. He had been stranded since Monday evening at Beto Junction, about 80 miles southwest of Kansas City. By noon, the storm had arrived in the Great Lakes with a mixture of blowing snow, sleet and frigid rain that disrupted most forms of travel. Airlines canceled almost 500 flights at Chicago’s O’Hare and Midway airports alone. Just a day earlier, whiteout conditions had made virtually all Panhandle roads impassable. A hurricane-force gust of 75 mph was recorded in Amarillo, which got 17 inches. The heaviest snowfall was in Follett, Texas, with 21 inches. 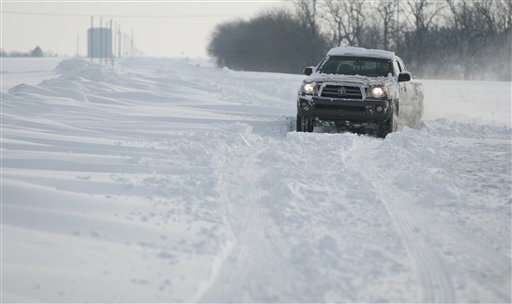 In Oklahoma, 600 snowplows and trucks worked to reopen roads. Climate scientists can’t say that man-made global warming is the cause of individual extreme weather events, but they say climate change in general makes such storms more likely because of what it does to the thermodynamics of the air and water. Warmer air in general holds more moisture, and when temperatures dance around the freezing mark — cold enough to fall as snow, but warm enough to hold lots of moisture — the storms dump more snow, especially if part of the system has been over unusually warm ocean water. “These storms didn’t just occur in a vacuum. They are fueled by record amounts of moisture in the atmosphere,” Pennsylvania State University climate scientist Michael Mann said Tuesday in an email. The back-to-back storms have raised hopes that the moisture might ease the drought conditions that have gripped the Midwest for more than a year. The snowpack now resting on the Plains will help, but it’s no drought-buster, experts say.